Demographics alone show drug abuse is spreading at an alarming rate, exceeding 10% for young adults between the ages of 19 and 24. Drug abuse shows no discretion when it comes to family, income, or where you live. Every one (1) out of eight (8) people are affected and it is rapidly increasing. If you look at S-Curve economics for any product’s debut into the market since the Roman times, you will see there is a general trend. 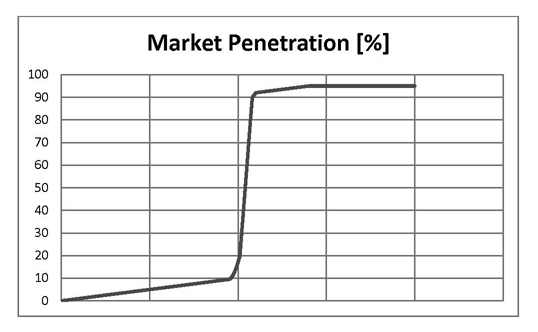 A product takes a significant amount of time, effort and investment to reach 10% market penetration, then there is a market explosion; reaching 90% penetration in a very short period of time. Heroin is just one of many abusive drugs that have followed S-Curve economics. During the 1990’s, when Aids reached less than 0.5% of the population, it was called an epidemic and captured national attention that accompanied federal funding and research. Drugs of Abuse have crossed the 10% mark and are increasing at an alarming rate. It is time to take a stand and look for effective solutions.